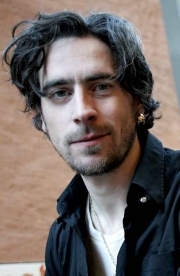 Ola Rapace (born Pär Ola Norell on 3 December 1971) is a Swedish actor. He is best known in Sweden for roles in the popular TV series Tusenbröder and the first season of the Swedish TV series Wallander which is based on Henning Mankell's Kurt Wallander books. Outside Sweden, his most notable work is in the 2000 Lukas Moodysson film Together which won several awards at international film festivals. He had a small role in the English language film Rancid . He is also known for his acting role as Daniel Nordström in the Danish police TV show Anna Pihl. He was married to the actress Noomi Rapace. They chose the surname Rapace together after they were married: it means "bird of prey" in French and Italian. Rapace lived in France for several years and speaks fluent French. He was convicted of drug offences in March 2009 after admitting taking cocaine. He was arrested in October 2008 while playing an amphetamine addict in the play Den ömhet jag är värd ("The tenderness I am worth") at the Royal Dramatic Theatre in Stockholm. Whole or part of the information contained in this card come from the Wikipedia article "Ola Rapace", licensed under CC-BY-SA full list of contributors here.